The Iron Dome anti-rocket was used for the first time on the Golan Heights Wednesday night. For the first time, Israel security forces used the Iron Dome anti-rocket system Wednesday night to deflect a missile fired at Israel from Syria. 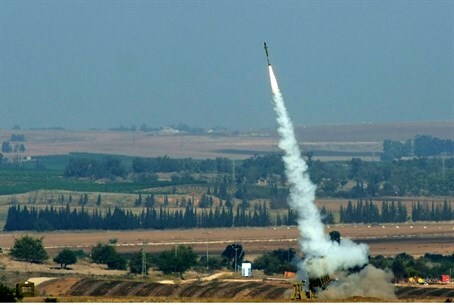 Several rockets were fired at Israel, with one landing in a forested area. Several fires broke out as a result, but were quickly doused. No injuries were reported. Defense officials said that the missiles were most likely mistakenly fired at Israel. The missiles were probably fired, the officials said, as part of the “victory celebrations” of forces loyal to Syrian President Bashar al-Assad. Assad won an overwhelming victory in elections in Syria Tuesday, garnering nearly 90% of the votes cast, despite the bloody civil war that has split the country apart for the past two and a half years. Elections took place for Assad's third term took place Tuesday. Results were announced Wednesday by Syrian election officials, who said that Assad had gotten 88.7% of the vote. According to the officials, 73.4% of Syrians participated in the elections. Out of the 15.85 million eligible voters in Syria, Assad got 11.63 million votes, they said.